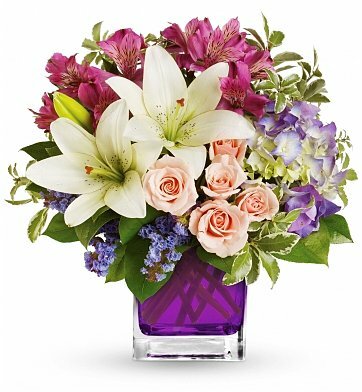 Elegant white lilies, delicate pink roses, purple hydrangea and more come together in this beautiful arrangement. Available for a limited time only, it's the thoughtful and inspiring gift they truly deserve. Assorted Lush Greenery and more. Hand delivery by experienced florists. Free Card with Your Message - specify occasion at checkout. Wine, Champagne, or Sparkling Cider. Standard Arrangement Measures 13" x 13". Same day delivery is available if you place your order by 2pm in your recipient's time zone, M-F and by 1pm on Saturday. To see if Sunday delivery is available in your area please contact customer service. NOTE: Exact flowers and vase may vary depending upon location and availability, but our uncompromising quality is always guaranteed. Garden Lily & Rose Bouquet is a hand delivered gift. These gifts are delivered by one of our local design centers located throughout the United States and Canada. Typically, standard deliveries are made between 9:00 AM and 6:00 PM, with business deliveries before 5:00 PM. Hours may be extended during holidays. Please note in some locations we may need an additional 24 hours for the delivery of exotic flowers, wine and fruit baskets. Same day delivery is available for most gifts when ordered before the cutoff time. The cutoff time for Garden Lily & Rose Bouquet is 2 PM in the recipient's time zone. For multiple quantity orders, please enter the zip code of the first recipient on your list. The process is quick & easy. I ordered flowers for same day delivery. They were delivered on time and were beautiful! My mom took a picture of them, and then sent me another picture with her holding them. I was very pleased with the arrangement. Thanks for putting a smile on my mom's face for her birthday! One of the best service ever, I have ever received. Excellent customer service, professional and on time. While the flowers and vase were very nice you forgot the mylar balloon. We paid for the mylar balloon and my daughter never received it. They were awesome and we got a great picture and report from friends. My flowers (well, my mother's flowers) were shipped on time as stated. They were quite damp, which was a plus and the freshness of the flowers was appealing. Highly recommend! They said it was beautiful and Ma was very pleased! Outstanding value, outstanding service, outstanding arrangement. Best service I have ever had when I called to place my order. The flowers were as beautiful as the photo! Thank you! My daughter was so pleased with her bouquet and the freshness of the flowers. They lasted a long time and as she was finally planning to dispose of them - a co worker grabbed them up for her own office and had a few more days' life out of them. I think that says a lot.... Thank you for the lovely attention to detail and ability to deliver on such short notice. We will use this florist again for sure. My mother loved the flowers. I had already gave her a present so she was very happy and very surprised. I sent this arrangement to my Sister who is in the hospital. This is my 3rd order and have been very satisfied! Your website was very simple to use, and the service was great- as usual! I've used this florist for years, (and only them) and my Dad used them while he was alive, for every floral arrangement he ever ordered- which was many. He was never disappointed, and neither have I. I've recommended this florist to many people. Arrangement looked beautiful and delivered as promised. I was very happy with the arrangement. It arrived on time and my friend loved it! Thanks! The arrangement is beautiful, and nearly identical to what I picked out online. Delivery was quick and efficient. Recipient pleased! Beautiful. Maureen loved it. Your service was exceptional. Thank you. I just want to say that the flowers were delivered in the same day & were absolutely perfect. My card was well written & legible. The only thing that I would say is that this vase appeared to be purple in color & it was not. It was my daughter's 25th birthday & purple is her favorite color but the arrangement was perfect and resembled the photo. Recipient described arrangement as "stunning". I had hoped it would live up to photo on website. I think it did! The recipient of my flowers loved them and said they made her office smell nice. Beautiful arrangement -- the scent was lovely! The arrangement was beautiful and very aromatic. The scent filled Karen's hospital room and was admired and enjoyed by all who entered. Many thanks! This awesome flower arrangement was over the top!!! It is for my daughter's birthday today. She was stunned by this bouquet's beauty and fragrance!!! She LOVED it!!! Many thanks to the wonderful and friendly people involved in helping get this together and get it delivered. Thank you to the amazing and talented Florist for adding her special touches to the bouquet and helping me make my daughter's birthday a very special and memorable one!!!!! She said they were so beautiful and full! Excellent gift and great service. I wanted to send a welcome to my daughter in her new home - the delivery was a nice surprise for her. She thought the flowers were just beautiful and her friends who saw them agreed; they said "wow" your mom made a great choice in the flowers. So I'd like to thank you for helping me welcome my daughter in such a special occasion. This experience was both fast and easy and delivered the same day. The flowers were wonderfully arranged and arrived in time to add to the party. Most people commented on the flowers and a few asked about where they had come from. We highly recommend this florist for arrangement, delivery and, of course, price. Regards. Flowers were delivered the same day and were beautiful. Great service. Beautiful flowers, on time delivery! She loved the flowers and they arrived when stated. Great job! My sister in the hospital in DC loved the arrangement. Her day was not going well when they were delivered, and then everything changed... The fragrance of the lilies was just what the doctor ordered. I ordered flowers for my Mom on-line. The flowers were delivered when I scheduled them and my Mom told me they were incredibly beautiful. She described them and were exactly what I ordered. I am very pleased. Will use them again. Timely delivery! I would use them again. Gorgeous and fresh, great color, my mom was very happy and so glad we used this company. Will definitely order again. Recipient decided not to purchase a centerpiece and used this arrangement as the centerpiece for her Easter dinner. She loved the pretty blue/purple vase.